One of the greatest things about drive-thru Digital Signs is that you can change the entire message that you present to your customer instantly. 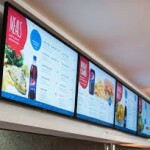 Prices for drive-thru Digital Signage have come way down, while resolution and picture quality have gone up even faster. In a way, Digital Menus are like movie screens. Displaying a menu and a static picture is only the start of what you can do. Did you know that if customers see an enticing picture of a menu item on your drive-thru digital menu board she is from 10% to 15% more likely to order it? But, that enamoration doesn’t last forever. Estimates vary, but a good guess is that after about 30 days, your customers will tire of that picture of that taco platter, no matter how mouth-watering it seemed to them at the onset. These are a sure way to make sure that your customers won’t get bored with the same old same old, and maybe even introduce them to a new food sensation and to give them yet another reason to return to your establishment. Yet, this is something that it is very hard to do with painted or printed signage. The costs of printing and manually changing the sign can be prohibitive. Not so with digital displays. Changing the display is as easy as changing the channel on a TV set. They say a picture is worth a thousand words, but how many pictures is one video worth. That’s right – videos. It’s absolutely amazing how few QSR’s take advantage of this second great advantage that Digital Menu Boards enjoy over old-style signs. Why show a picture of a cheeseburger when you can show a video of a happy customer biting into one? While it’s true that there is a large upfront investment that must be made to enjoy the function and flexibility of Digital Displays, you can do so much more with them. The trick to quickly paying back that initial investment, and then entering a world of pure profit is to use these great new tools to their fullest advantage.